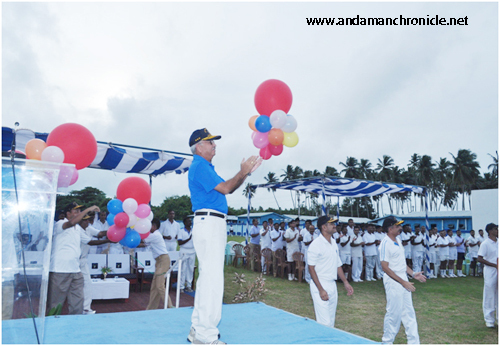 Car Nicobar, Sept. 24: Air Marshal PK Roy AVSM, VM, VSM, ADC Commander-in-Chief Andaman and Nicobar Command visited Air Force Station Carnicobar as Chief Guest from 21 to 23 Sep 13 on the occasion of its 21st Raising Day. He was accompanied by Air Cmde BV Upadhyay VM, Air Force Component Commander ANC. Air Force Station Carnicobar, born as ‘No 1 Staging Post’ in 1956, was upgraded to a ‘Forward Base Support Unit’ on 23 Aug 86, to be re- designated as an Air Force Wing on 15 Sep 93. Gp Capt SS Bains VM, was the first Station Commander of this Wing. Presently the station is being commanded by Group Captain Sanjeev Vashishth VM, a veteran of Kargil Conflict in 1999. The occasion was celebrated with gaiety and bonhomie over a period of two days. On 21 Sep 13, the CINCAN inaugurated a Surveillance Radar Squadron. The new Radar Squadron would help both civil and military aircraft for safe operations and enhance operational capability. He reviewed the inaugural ceremony of the Inter Unit Sports Meet 2013 in the evening. The ceremony was marked by an impressive march past by the participating teams followed by a nail biting exhibition volleyball match and an entertaining ‘Tug of War’ dual between the Warrant Officers / SNCOs and Air Warriors. The day culminated with a Social Evening organised in the Officers’ Mess. On 22 Sep 13, the Chief Guest witnessed the grand finale of Hindi and English Debate Competitions which have been conducted over a period of last seven days. This was followed by a display of the top five posters made by the Air Warriors of the Wing on themes of ‘Aerospace Safety’ and ‘Information Technology’ respectively. The biggest attraction of the celebrations was the variety entertainment programme organised in the evening which brought talents comprising the Station personnel as well as children of local schools. The event concluded with a community dinner with all Station personnel. Col Harmit Singh, Command PRO stated that visit of CINCAN on the occasion of the Station Anniversary proved to be a morale booster for the Station personnel. Raising Day celebrations are a part of military tradition and ethos and like always have enthused the feeling of pride and belonging amongst one and all.